Technical Pro makes top quality products for today’s professional recording and broadcast studios. The engineers on this team have you got you covered with respect to speakers, microphones, amplifiers and even ways to maintain quality control in your studio environment. If you have a studio with racks of gear it is important that you take steps to keep all of your equipment cool and running efficiently. 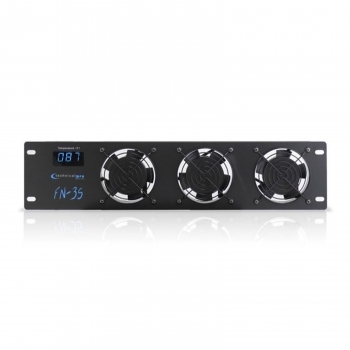 The FN3S is a 2.5U Rack Mountable Triple Fan Cooling Unit with Temperature Readout. Technical Pro designed this unit to keep all of your equipment and heating problems on ice! The FN3S can fit into any standard rack and push out the hot air that often gets trapped. If you have racks of gear sometimes running for 24 hours a day and 7 seven days a week you will have pockets of hot air that will form and become trapped within the racks and the air space of your studio. Heat will destroy your equipment! This unit will push out 324 cubic feet per minute of heated air and its ULTRA QUIET design will make you forget that it’s even there! The FN3S is so effective in combating your entire studio’s heating issues that it is a must have! The FN3S fits into any standard rack and will take up 2.5 units of space. The front panel shows a digital display temperature readout. One quick look to the front panel and you know the exact temperature of your racks. No more guessing or hoping you will not overheat! Take control of the situation and keep your gear cool! Inside is a built in high power exhaust fan that will prevent the unit from becoming hot! This is a must have for any studio! If you see this in the racks in a studio you know that this studio is of a professional grade that takes good care of its equipment. This cooling unit will save you in the cost for repair of overheated equipment, you don’t need to worry anymore! The FN3S from Technical Pro is professional product for today’s professional studio, and at price that won’t break the bank!